Watch the The Great American Divide session at the World Economic Forum's Annual Meeting 2017 here . Income inequality is a hot topic in the US, and in countries around the world. Terms such as the ‘top 1%’ or ‘bottom 90%’ dominate the discussion. But it can be hard to visualize exactly how much of the pie these groups are taking home. Now thanks to howmuch.net, for the US at least, the picture is clearer. Howmuch.net used the following diagram to track the distribution of income in the US over 35 years. The graphic is best explored yourself, but there are several familiar trends in the visualization. The largest section (in yellow) shows the bottom 90%. From 1979 to 2014, their share of income fell from 67.65% to 52.66%. This has been offset by increases in the other five groups. The top 1% has seen its share rise from 5.87% to 10.36%. The top 0.01% now takes 3.19% of total income. What lies behind this trend? The Economic Policy Institute says it is down to two things: “policy choices and cultural forces, which have combined to put downward pressure on the wages and incomes of most Americans.” The result? 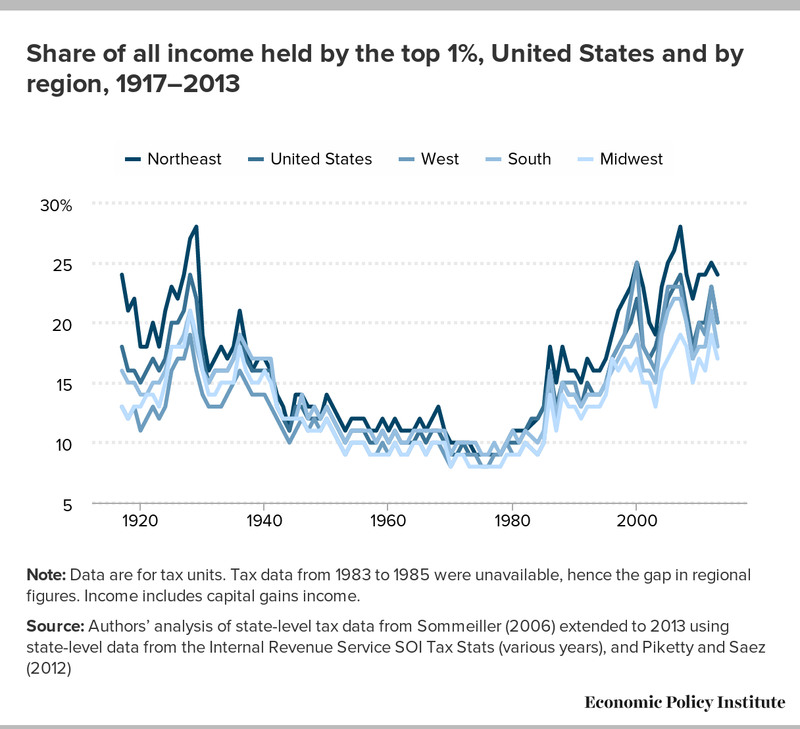 Inequality in the US has been rising since the late 1970s. The situation in the US is very similar to what has been happening elsewhere. Earlier this year, Oxfam released a startling report . The charity’s research suggests that the richest 1% now hold over 50% of global wealth. The report also says that 62 billionaires now own the same amount of wealth as the poorest half of the world’s population. This inequality not only fuels discontent, but it also damages economies, according to the IMF , which found that a 1 percentage point increase in the income share of the top 20% drags down GDP growth by 0.08 of a percentage point in the following five years.